You are here: Home / Chennai / GWG’s PACKAGE for NEBOSH IGC Chennai at Register Today !!! GWG’s PACKAGE for NEBOSH IGC Chennai at Register Today !!! Limited Period Offer!! Book your Enroll Today.!! Green World Group is the registered organization for occupational health and safety institute which is providing UK approved HSE certification courses like Nebosh, IOSH, HACCP, HABC, ADOSHEM, Diploma in offshore safety course, Diploma in Fire engineering & safety environmental course and Safety Media courses etc. GWG has a branches in UAE, Saudi Arabia, Nigeria, Angola, Oman etc. 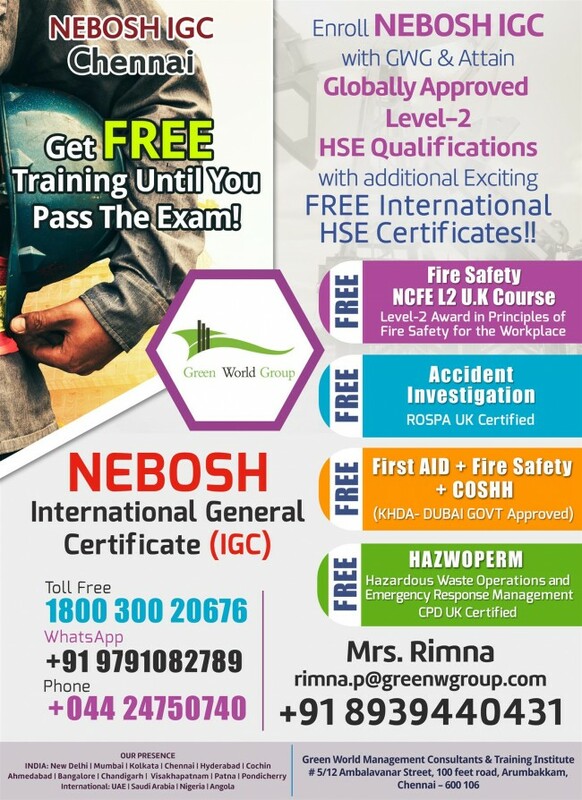 Enroll NEBOSH IGC with GWG & Attain Globally Approved Level-2 HSE Qualifications with additional Exciting FREE International HSE Certificates !! Join NEBOSH IGC – CHENNAI @ Get Free Training Until You Pass The Exam ! HAZWOPERM- Hazardous Waste Operations and Emergency Response Management CPD UK Certified. Tel :044 24750740 | 044 42845419.